Baby Bananas, Baby! | Keep It Up, David! I can’t remember when I first saw baby bananas at the grocery store, but lately I’ve been seeing them all the time. Usually they’re in bunches numbering well over a dozen, and since I live alone, I rarely buy over a dozen of anything. 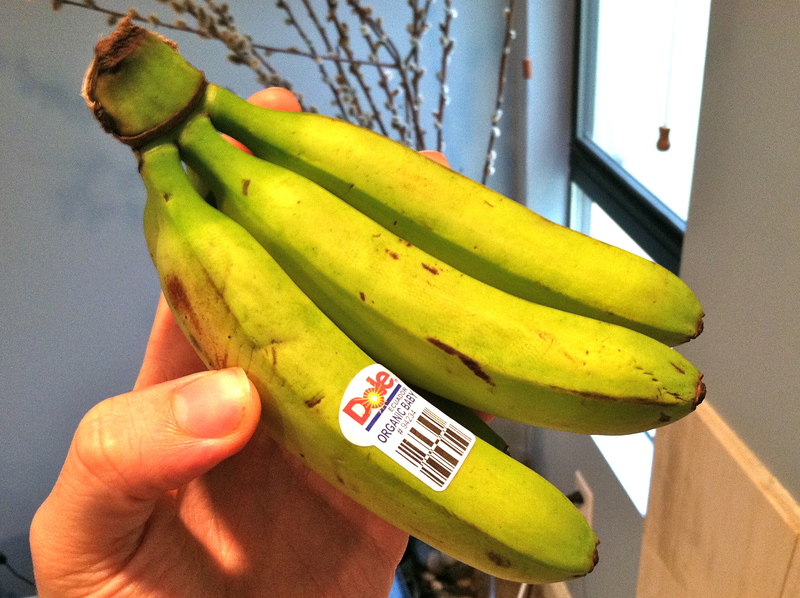 Last week, though, I saw much smaller bunches of baby bananas, so I picked up five. They’re ridiculously adorable – like bananas, only smaller. Much smaller. All five fit in the palm of my hand. 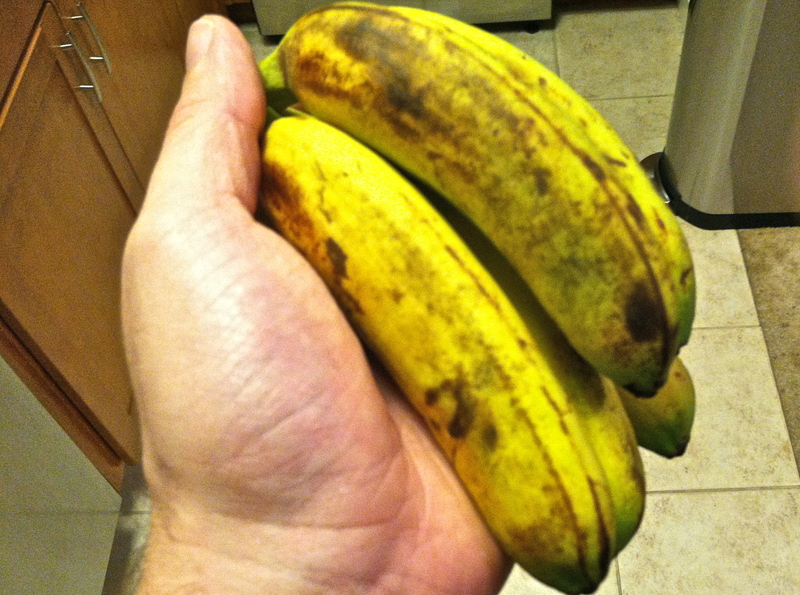 I didn’t know much about baby bananas, but I assumed that, like big bananas, they’d be ripe when they turned yellow. So I kept them on my kitchen counter, and a few days later, I noticed that they were turning both yellow and brown at the same time. Uh oh. Better start eating them! Baby bananas are harder to peel than regular bananas, because their skins are thinner. I ended up squishing the tip of the banana before I got things under control. 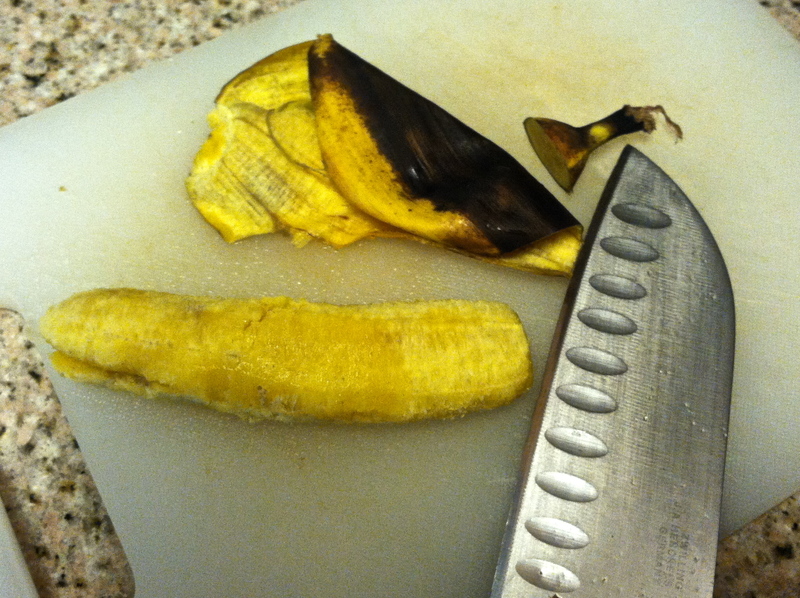 Even though the banana was turning brown, the flesh was clearly under-ripe. I ate the banana too soon. Oh, and one more thing, and you MUST do this, or else your adventure in little bananas will surely fail: LITTLE BANANAS TASTE HORRIBLE UNTIL THEY’RE RIPE – AND RIPE, FOR LITTLE BANANAS, IS NOT YELLOW! You need to let the fruit turn brown or else it will not be sweet or soft enough. This will go against every banana extinct you have been trained to adhere to. Trust me. So the rest of my baby bananas stayed on the counter, and, just like he said, every time I looked at them I wanted to eat them immediately because I thought they were going bad. Surely that’s brown enough, right? It was. I avoided the trouble of trying to peel them with my fingers, and instead cut off the tip with my knife, and cut a slit down the length of them, which made them a breeze to peel. 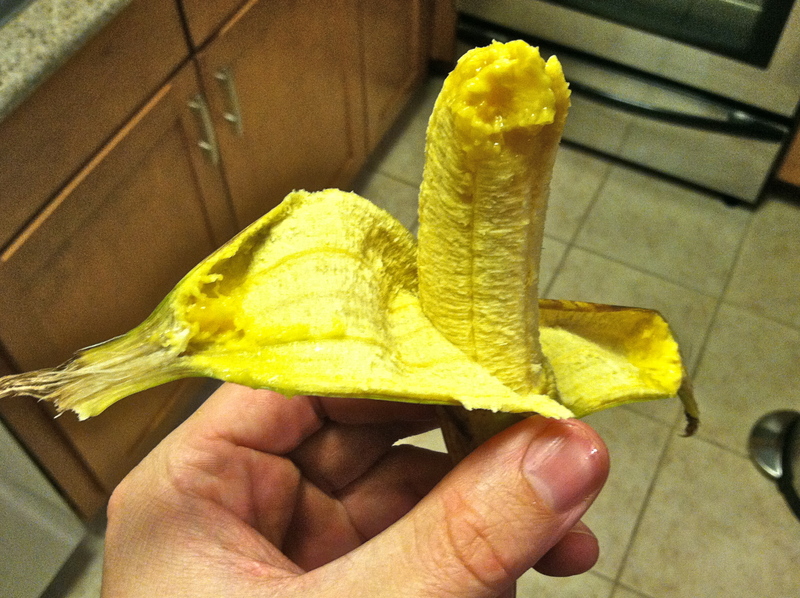 Now that’s a good banana! It tasted just like its bigger buddies, but a little bit sweeter, and it had a smoother, creamier texture. I learned a lot more about bananas while prepping for this post. Like how there’s over 1,000 varieties of bananas in the world, but 99% of the ones you see in stores are of the Cavendish variety, which is easy to grow and transport. The Cavendish is also endangered – there’s a disease making its way through southeast Asia that wipes out entire banana plantations, and scientists fear if the disease migrates to Central and South America, it could wipe out the entire species within a decade. Here’s a recent article, and the granddaddy article from 2005 that eventually was expanded into a book that I’d like to read. The book, called Banana: The Fate of the Fruit That Changed the World, was written by Dan Koeppel, who also wrote the baby banana blog post I linked to earlier – turns out he’s quite the banana authority! One final banana fun fact: Contrary to popular belief, bananas don’t grow on trees. Banana plants are actually the world’s largest fruit-bearing herb (!). There also isn’t a banana season – banana plants continually bear fruit all year long. 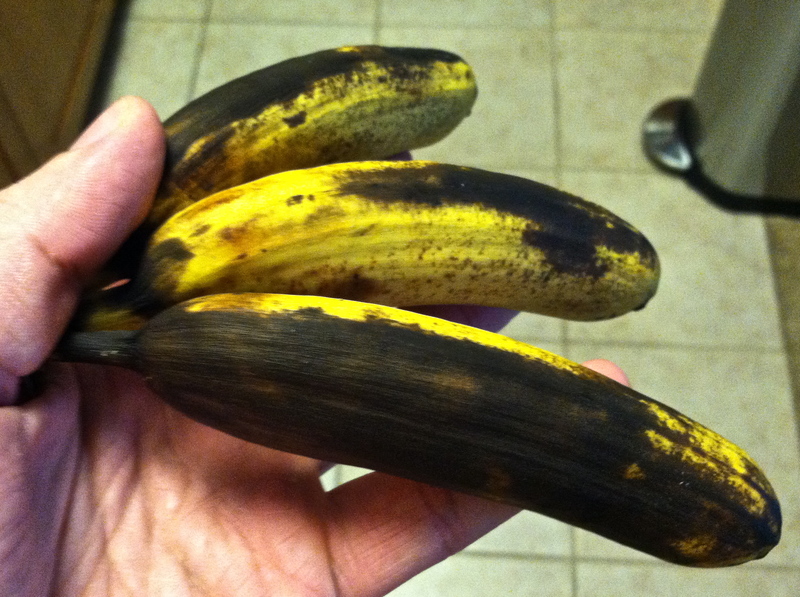 I don’t know if baby bananas will make a return to my kitchen or not… I ended up eating the final three all at one time, so it was roughly the same as eating a full-sized banana, with a lot more work. But you know me – I love trying things for the first time, and I loved trying baby bananas. This entry was posted on Tuesday, May 1st, 2012 at 1:08 am and is filed under Uncategorized. You can follow any responses to this entry through the RSS 2.0 feed. You can leave a response, or trackback from your own site. 5 Responses to Baby Bananas, Baby! Haha – well, I am a primate! Thanks for the tip! I didn’t know that about bananas. Great tip!